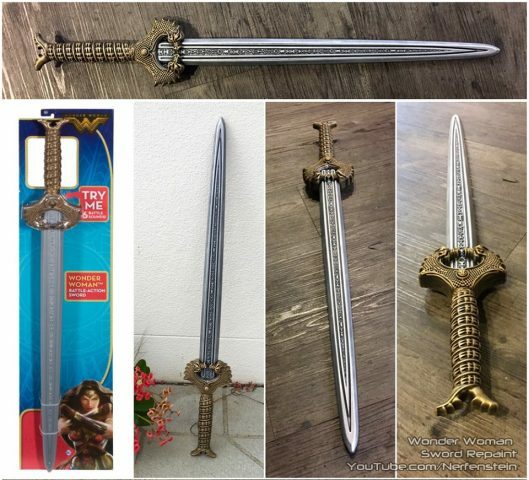 Wonder Woman Toy Sword Modification « Adafruit Industries – Makers, hackers, artists, designers and engineers! If you’re wondering about the best ways to modify a toy prop or weapon to make it look a litle nicer for cosplay or display purposes, Nerfenstein Blaster Mods has a lot of knowledge to share. She takes inexpensive items like Nerf guns and turns them into cooler looking props with paint, foam, and other materials. She recently repainted a Wonder Woman toy sword to take it from lackluster plastic to a more metallic looking blade. This particular toy comes with a surprising amount of details, and she makes them pop by painting the sword completely black and adding highlights with dry brush techniques and acrylic paint in metallic hues. You can get a quick glimpse at the before and after images below. Get more tutorials at Nerfenstein’s YouTube channel.